"When he turned 1-year-old, we noticed the enlarged spleen. It was like a ball on the side of his ribs. It was visible, growing everyday. Doctors said he has a tumor in his liver. An urgent surgery was done. In a few years, it came back, bigger than ever. After the second surgery, he needed a pouch to collect his stools. He lived with it for more than 5 years. He used to cover the tube with a shirt and go to school. He has to change his clothes frequently. His classmates laughed at him. 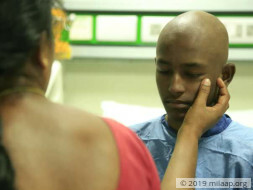 Only he knows how painful this struggle has been, against a tumor which is now taking his life." - Lakshmi, mother. Venkatesan and Lakshmi had a love marriage. As if rejection was not enough, Lakshmi was beaten and stabbed by her own family and was admitted to hospital for 3 months to recover. It was only when Jaya Surya was born that they felt joy. However, they were unaware of the tragedy that lay in store. "I ended up spending lakhs to save Lakshmi. I was forced to take loans. When Jaya Surya was born we had to begin from scratch. We were happy to work for him day and night. When we heard that he has tumor we thought the universe is punishing us. I have been in debt, taking odd jobs just to make more money. People who helped are coming back for repayment. There are days we go to sleep without having any food." - Venkatesan. 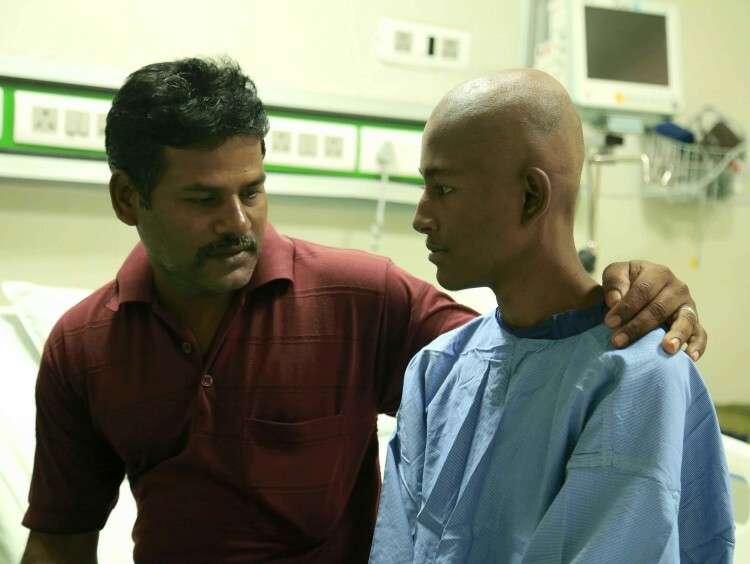 Jaya Surya had his third surgery when he was 12. The colostomy bag was removed to improve his quality of life. His parents took him to the hospital every month and were very protective of him. They believed that their bad times have come to an end. He was even studying well at school. 2 months ago, when he began to bleed profusely from his mouth and nose, they knew it was not over. "He bleeds heavily from nose and mouth, 4-5 times in a day. Every minute, we feel like he is dying. All three of us just sit and cry feeling helpless because we cannot afford a liver transplant. Nothing else can save him. He is at home with us now, aware of our situation. He once said, 'Don't cry after I'm gone. We have to stay strong for each other.' I feel suicidal, unable to save my son." - Lakshmi, mother. 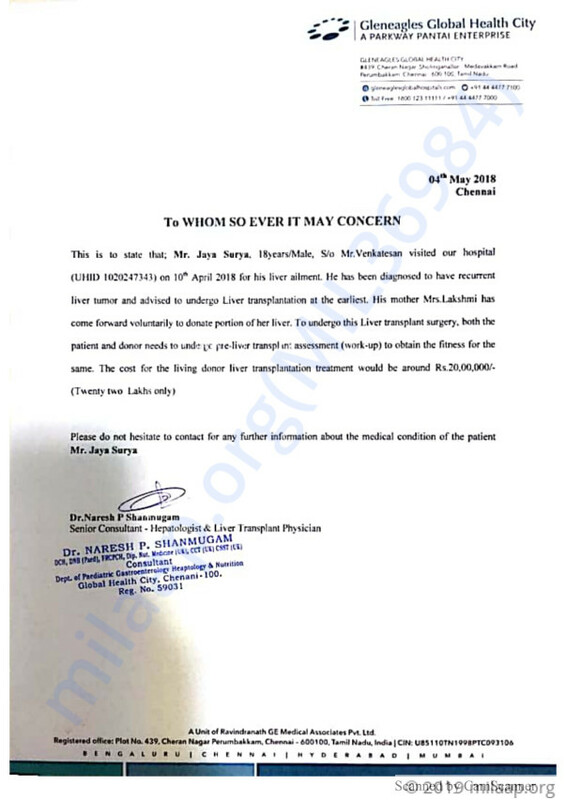 Lakshmi can donate a part of her liver to Jaya Surya. The problem is that they cannot afford the surgery. His parents are struggling to even get 3 square meals every day. Venkatesan made Rs 350/day but he has not worked in 2 months. The transplant requires Rs 20 lakhs. "Jaya Surya has lost hope. We want to hold on to every ray possible. We will die if we cannot save him. Our last option is to ask India for help." 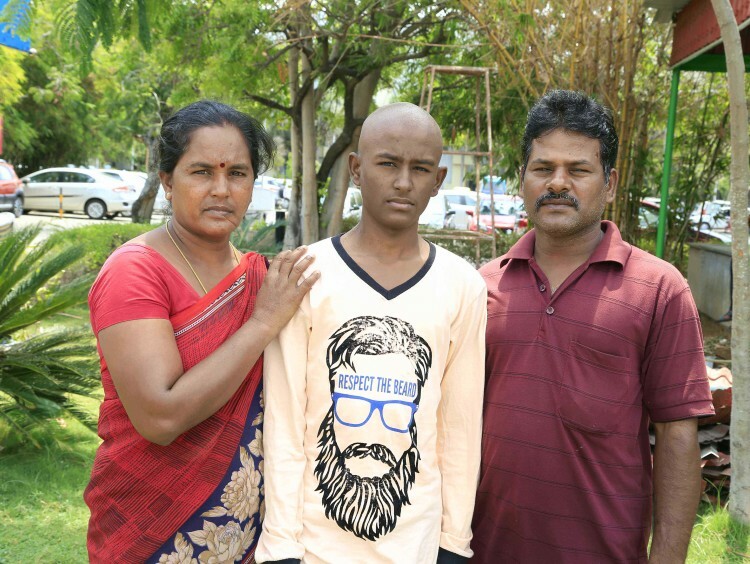 Your contribution can give Jaya Surya a chance to live his life! Here is an update on Jayasurya. He successfully underwent the transplant. He had some infection post transplant and was admitted in the hospital for 12 days. He is now discharged and is on regular follow up with the doctor. A part of his Liver was used for the transplant. Family would like to thank each and every one of you for the wonderful contributions. Please continue praying for him and will keep you updated regarding his health. Thank you for your support. We would like to inform you that Jaya Surya underwent a Hepatectomy surgery and got discharged in a stable condition. 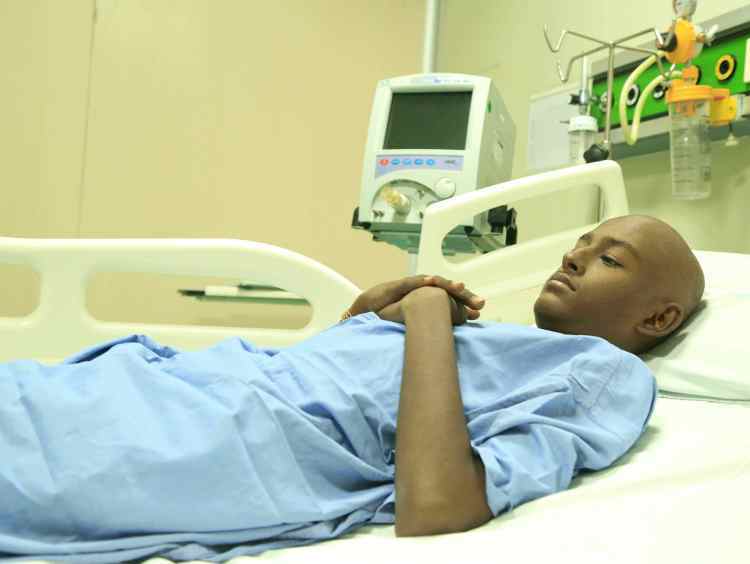 His transplant date will be intimated later once his mother's (identified donor) is physically fit to donate. Jaya Surya's transplant has got postponed as his mother who is planned to be the potential donor has high sugar levels which need to be brought down in order for her to safely donate for the transplant. Hence Doctor has recommended that after 2- 3 months of assessment a transplant date will be fixed. In the meantime as a back up Jaya Surya has also been added to the cadaver list. We will keep you posted on the status. Thank you once again for your support.